WEST LAFAYETTE, Ind. (AP) Isaac Haas provided the perfect remedy for No. 3 Purdue’s ills on Wednesday night. With Vincent Edwards not at 100 percent, the 7-foot-2 center went to work. He repeatedly posted up for baskets, drew fouls on Maryland’s big men and nimbly found teammates to take care of things on the outside. He even delivered the knockout punch in the final minute. Haas finished with 22 points and nine rebounds, capping the 75-67 win over Maryland with a thunderous dunk that extended the nation’s longest winning streak to 18. Right now, it seems nothing can derail these Boilermakers (22-2, 11-0 Big Ten), who are off to their best start in conference play and seem to achieving new milestones every game. This time, the defending Big Ten champs broke the school record for most consecutive wins in league play with No. 13. They also maintained the nation’s second-longest active home winning streak with No. 21. Only Cincinnati (38) has more. And they did all of it with Edwards, one of the front-runners for conference player of the year, not feeling well. He struggled through warmups, left for the locker room during the first and looked content doing his part as facilitator. He finished with eight points, 11 rebounds and five assists. Haas and Carsen Edwards, meanwhile, had no trouble taking care of the rest. While Haas went 8 of 14 from the field, Carsen Edwards scored 17 points on a night the Boilermakers led from wire to wire. Bruno Fernando finished with 20 points and 10 rebounds and Kevin Huerter added 16 points to lead Maryland (15-9, 4-7), which endured another frustrating night. The Terrapins missed their first six shots, immediately fell into a 9-0 deficit and spent the rest of the game futilely playing catch-up. They have lost three straight, the last two to top-10 teams. Maryland did manage to make it interesting by scoring the first five points of the second half to get within six at 35-29. 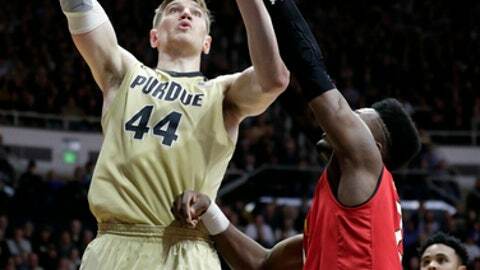 But every time the Terrapins made a run, the Boilermakers answered – usually with Haas. It happened again when Huerter knocked down the last of three consecutive 3s with 9:17 to go, cutting the deficit to 55-52. But Haas made two free throws, Thompson made a 3 and Haas threw down a dunk to make it 62-52. The Terrapins couldn’t get closer than six again. Maryland: The Terrapins’ showed some grit Wednesday. Despite never leading, never being tied and only making it a one-possession game once in the final 38 minutes, they fought hard enough to cause the nation’s hottest team some anxiety late. Purdue: The Boilermakers seem to have all the answers. If Haas isn’t dominating the middle, the guards are tearing it up from the perimeter. And if Purdue isn’t shooting well, the defense is. They just continue to get better and deeper. Maryland: Missed its first six shots and had 11 of 14 turnovers in the first half. … The Terrapins are 3-6 since a six-game winning streak ended. … Maryland has lost four straight in the series. … Despite being one of the nation’s top rebounding teams, the Terrapins only had a 33-32 edge. … Darryl Morsell had 13 points and nine rebounds. … Anthony Cowan Jr. had 11 points and eight assists. Purdue: Has only allowed one team, Michigan, to top 70 points since Dec. 3. … The Boilermakers have tied Ohio State for the second-best start in conference play over the last 20 years. Only Illinois, at 15-0 in 2004-05, was better. … Purdue’s shot 44.8 percent from the field and has now shot 44.3 percent or better in 16 consecutive games. … The Boilermakers Finished with four turnovers, tied for fifth-fewest in school history. Maryland: Returns home Sunday to face Wisconsin. Purdue: Will try to extend its seven-game road winning streak Saturday at Rutgers.